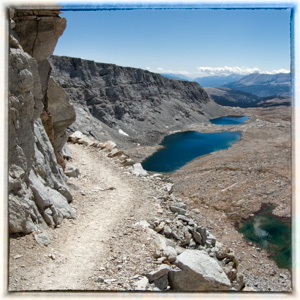 Almost everyone who hikes the John Muir Trail arranges for a resupply at Muir Trail Ranch. That makes sense, since the ranch is almost exactly halfway between Happy Isles and Mount Whitney, at least in trail miles. MTR also divides the trail into two distinct, and somewhat different, hikes. Most people find the northern half to be quite different than the southern half. Here are some of the differences; I’ll assume you are starting in Yosemite National Park and are hiking southbound. Resupply. The biggest difference may be in the weight of your pack. Because there are no less than four places, concluding with MTR, to resupply in the northern half, one never needs to carry more than three days of food. If you are a fast hiker, you can even carry less than that. On my hike, this year, I left Happy Isles with two days of supplies, I left Tuolumne Meadows with two days of supplies, and I left Red’s Meadow with three days of supplies. If I planned a stop at Vermillion Valley Resort, I could have kept my pack even lighter. Contrast that with the eight days of supplies I’ll have with me when I depart Muir Trail Ranch. The southern half of the trail is often carved through far more unforgiving terrain. Elevation. The northern half of the JMT is lower than the southern half. About fourteen of the approximately 108 trail miles north of MTR are above 10,000 feet. You should be able to sleep under 9,000 feet almost every night (and some nights below 8,000 feet). Once you head out of MTR things will be quite different. About two-thirds of the last 103 miles are OVER 10,000 feet. You may be able to sleep under 10,000 feet a few times, but once you start up the trail to Forester Pass you’ll not breath the thick air again until your descent into Whitney Portal. Other Hikers. Most people find far more hikers in the northern half than in the southern half. Near Yosemite Valley, near Tuolumne Meadow, near the Devil’s Postpile, and near VVR you will run into day hikers. I’ve even run into day hikers on Seldon Pass, nearly eight miles from MTR! Once you leave Muir Trail Ranch heading south, fellow hikers will be less common (although you’ll likely run into at least a couple every day). Scenery. The last difference is a matter of scenery. Although it’s tough to beat the granite monoliths of Yosemite, or Vernal and Nevada falls, I find the scenery in the south to be just as good. The mountains are higher, the peaks more imposing, and the trail often is carved through more difficult terrain. Even the flora and fauna change. You’ll find many more aspens in the south, and the only bluebirds I’ve ever seen on the trail were in Crabtree Meadow, just a day from the top of Whitney. All of this is a happy coincidence. Much of what makes the northern half different also makes it easier, which means you have time to develop your “trail legs” before the challenges of the south. Lastly, the changing scenery gives you something to look forward to as you leave MTR, most likely with the heaviest pack of the entire trip.